Free Shipping Included! 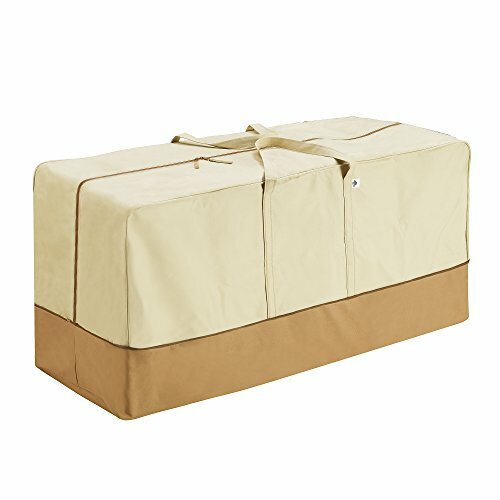 Villacera 83-DT5798 7352 Patio Cushion Cover Bag, Beige and Brown by Villacera at COTM Blog. MPN: 7352 Patio Cushion Bag. Hurry! Limited time offer. Offer valid only while supplies last. Villacera is pleased to offer its quality Patio Cushion Cover for those that believe protecting an investment should not cost like an investment. Villacera is pleased to offer its quality Patio Cushion Cover for those that believe protecting an investment should not cost like an investment. These covers are very sturdy, will hold up to cold or hot weather, and will protect your Patio Cushions year after year. The Villacera Patio Cushion Cover features an elastic hem with a toggle and heavy-duty buckle, and side vents to let out moisture. The Villacera Patio Cushion Covers stand up to even the harshest weather, including rain, sleet or snow. Sturdy reinforced handles provide easy lifting and removal.